Missouri Finally Has Prescription Drug Monitoring, So Why Can’t Prescribers Use It? For five years now, the Missouri legislature has considered legislation to create a prescription drug monitoring database that would allow pharmacists and physicians to look at their patient's prescription history for signs of misuse of narcotics. And for five years, Missouri pharmacists like Erica Hopkins have watched those efforts fail with disappointment. Without it, “it’s up to us to try to make sure whatever prescriptions we are filling are valid,” says Hopkins, a former president of the Missouri Pharmacy Association. In July, the state’s governor, Eric Greitens, released an executive order creating a prescription drug monitoring program. Unfortunately for Hopkins, it’s not the solution she was hoping for. “It feels like putting a Band-Aid on a huge wound,” Hopkins says. Opioid overdose deaths have been on the rise in Missouri, as they have been across the country. Last year more than 900 Missourians died from an overdose. 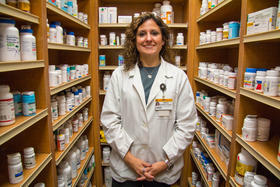 For every 100,000 Missouri residents, there are 89,000 prescriptions for narcotics. Every other state in the country has a drug monitoring program that tracks those prescriptions, giving doctors another tool to help patients who may be fighting addiction. Gov. Greitens’ new order creates something like what other states have but with a big difference. Instead of allowing providers to look at data on their patients, like other drug monitoring programs, Missouri’s new program will track data on doctors and pharmacists themselves. It would have taken an act of the legislature to make Missouri’s program look like other states’, says Dr. Randall Williams, director of the state’s Department of Health and Senior Services. Williams says both he and the governor support a statewide prescription drug monitoring program that could be used by providers, but their hands are tied. Instead, the new program will give the state a tool to examine the providers who may be inappropriately or illegally prescribing narcotics. The state will purchase data about prescribing patterns from pharmacy benefit managers, the third-party companies that handle prescriptions for insurance plans. When they detect suspicious patterns, for instance over prescribing opioid painkillers, the Department of Health and Senior Services can send that data to professional licensing boards and law enforcement, which can then take disciplinary action as appropriate. In July, the state signed a $250,000 per-year contract with Express Scripts, which handles prescriptions for about 42 percent of Missourians. The state will seek similar contracts with CVS and United, and together these three would yield data from just about every patient in the state. And those companies are already analyzing their own data for prescribing patterns. “If you could go to one of these [pharmacy benefit managers] and see what they’re capable of, you would see just how revolutionary we think this is,” Williams says. Williams says Missouri is the first state to enter into these kinds of contracts with pharmacy benefit managers, but the companies may start offering the tool to other state programs and even directly to health care providers through the private market. “We think this has national implications,” says Williams. But because Missouri’s new monitoring program is not for patient care, some providers like Lucas Buffaloe, a family physician in Columbia, have concerns about how it will be used. “There are prescribers in our state who are prescribing large quantities of opioid pain relievers or sedative medicines—they are doing so in a responsible and appropriate manner,” Buffaloe says. He notes palliative care specialists in particular have legitimate reasons for prescribing a lot of opioids. “Our hope is that anyone who is reviewing [prescribing] information is going to take that into account,” he says. A Tool for Public Health or Law Enforcement? For physicians like Buffaloe, the new state program won’t help them keep their patients safe. But many providers have recently started using an alternative prescription drug monitoring program. In 2016 after the state legislature failed to pass a law to create a statewide program, St. Louis County created its own. One by one, counties around the state have been joining that database, called the St. Louis County Prescription Drug Monitoring Program. It now covers over half the state's population including all of the major urban areas: St. Louis, Kansas City, Independence, Springfield and Columbia. 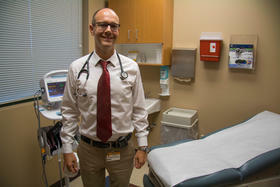 The program has been useful for providers like Lucas Buffaloe, who has had access to the database since March. He learned through the database, for example, that one of his patients who was taking opioid pain relievers was also being prescribed a sedative by different physician. “That combination can be very dangerous,” Buffaloe says. Because he knew about it through the drug monitoring program, he was able to address the issue with the patient. And until every county in state joins St. Louis County’s program, she thinks it will still be too easy for people misusing prescription drugs to skirt protection. The state’s new monitoring program will run parallel to this county-to-county one: the former won’t limit the power of the later, but it also doesn’t create a statewide database designed for patient care. That raises a broader question: is prescription monitoring a tool for public health or a tool for law enforcement? “If you look at monitoring programs around the country, it’s a tool for both,” says Patrick Knue, director of Brandeis University’s Prescription Drug Monitoring Program Training and Technical Assistance Center. Prescription monitoring began in the late 1930’s solely as a tool for law enforcement. But beginning in the 1990s health care providers began to see the value in the data. Since then, every state but Missouri has allowed their providers to access a statewide program. Missouri’s new program is a good first step, Knue says, but eventually he thinks the state should allow their providers to access a statewide database as well. “It’s a tool, and the more people who have access to the tool to ensure good patient care, I think, is very important,” Knue says. This story was produced with Side Effects Public Media, a news collaborative covering public health.